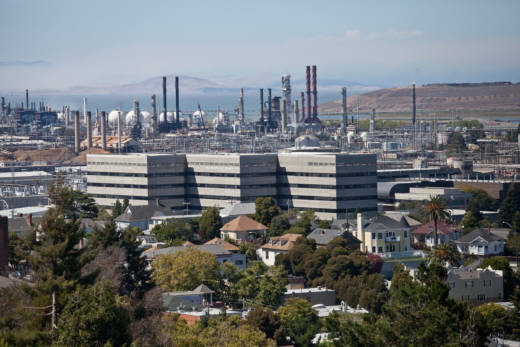 California is getting an Environmental Justice Bureau charged with looking into polluters who operate in low-income and minority neighborhoods. A spokesman for state Attorney General Xavier Becerra says the new team will have four lawyers when it's fully staffed, and is funded from the department's existing budget. It's unclear, however, where the funds are being apportioned from. Studies show that hazardous industrial facilities tend to be located in minority neighborhoods. One long-term study that reviewed 30 years of demographic data found a "consistent pattern" of placing hazardous waste sites where poor people and people of color live. "Minorities and low-income communities are seen as the path of least resistance because they have fewer resources and political clout to oppose the siting of unwanted facilities," said the 2016 report, published by the University of Michigan and University of Montana. Another long-term study, Toxic Waste and Race at Twenty, found more than half of all people in the U.S. who live within 1.86 miles of a hazardous waste facility are minorities, exposing neighborhoods dominated by people of color to higher rates of air pollution. The new environmental justice unit will focus on cleaning up contaminated drinking water; reducing exposure to toxics in consumer products; and penalizing illegal discharges to air and water affecting low-income and minority neighborhoods. The office will continue to challenge federal decisions that could affect the health of vulnerable neighborhoods. Among the issues the new unit is expected to look at includes a federal case concerning the storage of coal at the Port of Oakland. A spokesman for Becerra's office said the state joined the suit by filing an amicus brief in support of Oakland's coal ordinance in order to "send a strong message that the time for taking advantage of communities of color is no more." Becerra's new unit has injected optimism among local activists. A bill introduced by Assemblyman Eduardo Garcia (D-Coachella) would establish an environmental justice fund for monies from penalties and court settlements, which can then be used for further investigations. California has emerged as a prominent challenger to the Trump administration's efforts to restructure U.S. environmental policy. “We’ve got the scientists, we’ve got the lawyers, and we’re ready to fight,” Governor Jerry Brown said during a speech to the American Geophysical Union last December. Since Trump took office, Becerra has filed more than two dozen lawsuits against the Environmental Protection Agency, Department of Energy, Department of Interior, and others. The lawsuits include challenges to federal decisions to repeal fracking regulations and suspend a 2015 rule that would have protected more California rivers under the Clean Water Act. The Environmental Justice Bureau is part of a broader effort by Becerra to clamp down on polluters in the state. According to his office, almost half of the 26 federal lawsuits he has filed so far have focused on children's access to clean air and drinking water. The announcement of the unit comes just weeks after the U.S. Environmental Protection Agency eliminated a key Clinton-era measure that regulated air pollutants such as arsenic, mercury and lead. “This is among the most dangerous actions that the Trump EPA has taken yet against public health,” John Walke, clean air director at the Natural Resources Defense Council (NRDC), said in a statement. A spokesperson for Becerra's office says positions in the new unit will be filled soon.